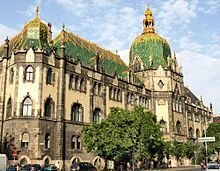 The Museum of Applied Arts (Hungarian: Iparművészeti Múzeum) is a museum in Budapest, Hungary. It is the third-oldest applied arts museum in the world. The architect is Art Nouveau. It was built between 1893 and 1896 and was designed by Ödön Lechner. It has a green roof and the interior is designed using Hindu, Mogul, and Islamic designs. The building is in need of renovation, for which plans have been developed. The museum houses a collection of metalwork, furniture, textiles, and glass. It also has a library. There are two other locations: the Hopp Ferenc Museum of Eastern Asiatic Arts and Nagytétény Palace. ^ a b Hewitt, Rick Steves & Cameron (2009). Rick Steves' Budapest (1st ed.). Berkeley, Calif.: Avalon Travel. ISBN 9781598802177. Wikimedia Commons has media related to Budapest Museum of Applied Arts. This article about a museum in Hungary is a stub. You can help Wikipedia by expanding it.